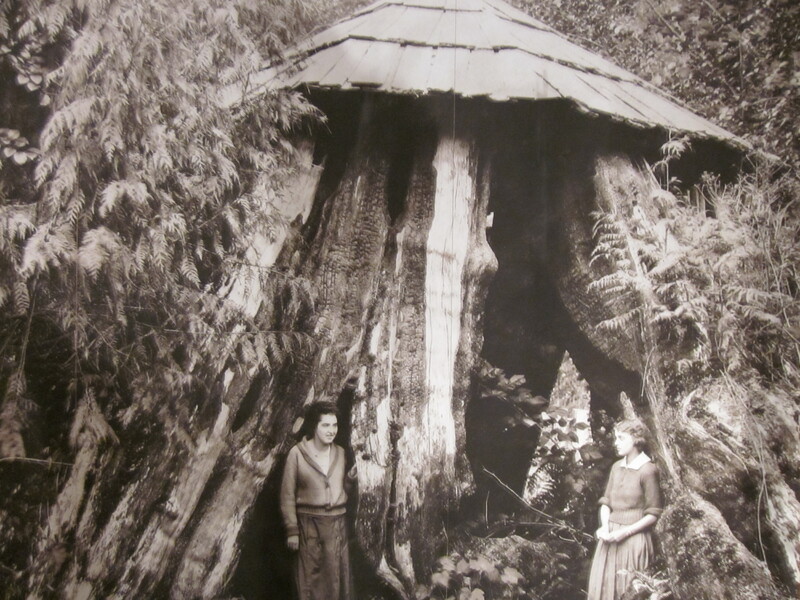 Back in the day, people in Bellingham lived in stumps. Totally not kidding. Over spring break, while Matt was in China, I went to visit my mom in Bellingham, Washington, where I grew up. When I was a child, it was a pretty small place, mostly populated by bombed out Vietnam War veterans and hippies. I mean this literally. My high school geography teacher was deaf from his years in a bomber. We knew people who kept goats, and sometimes the goats lived with them inside. We foraged for berries and clams a few blocks from our house. The town was, at the time, remote. This has changed. It is now a destination of sorts, at least for retirees. The university has grown from a glorified teaching college to a desirable place to get an education statewide. There are restaurants without the word “shack” in their names. Parts of the city have expanded so dramatically that I get lost on the new roads leading to new developments with new schools. The beaches are lined with condos. There are people who actually commute from Bellingham to Seattle, although it is 90 minutes away by car without traffic. If some parts of the US are emptying out, other parts are filling up. When I got older I became itinerant. Since I graduated from high school, I have never lived more than three years in one place. My mom has lived in Bellingham for 35 years. We try to visit, but manage it only rarely. On this trip I realized that although I remembered how to get around the older parts of town, I had forgotten a lot about it. It is not an accident that this was the place I learned to ride my bike. Although it is hilly, it is a bicycle-friendly place, and then some. While I was in town I mostly drove, because my mom hasn’t ridden a bike in years, does not currently own a bike, and lives at the top of a hill far from public transit, which is pretty limited anyway. My mom has a Prius and after driving it for a week I decided that (a) I hate driving and (b) I hate driving a Prius, which has terrible sight lines and a weird turning radius, and made me feel even more like a road hazard than usual. And getting the kids into and out of the car was a huge hassle compared to loading a bike. Going to Seattle to visit Family Ride was a relief. 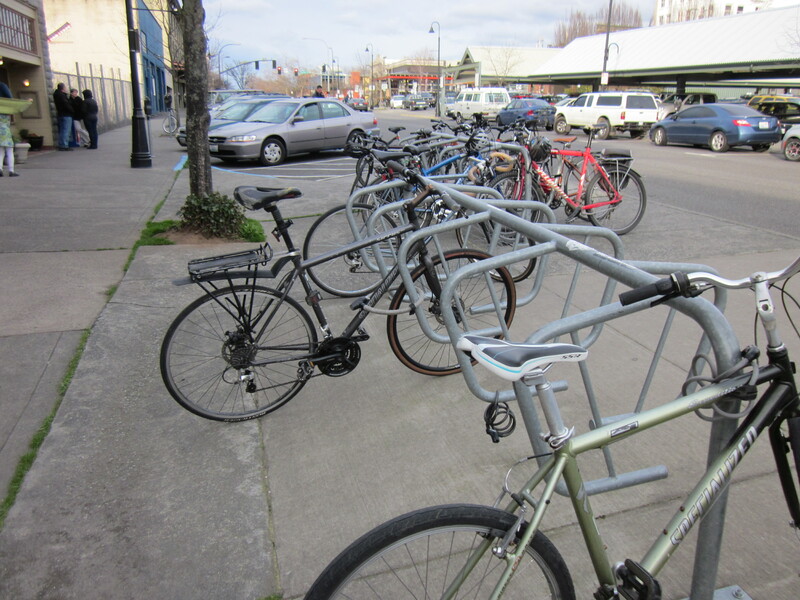 But I was pleased to see all the ways that Bellingham welcomes bikes for those who choose to ride them, and encourage people who are on the fence. 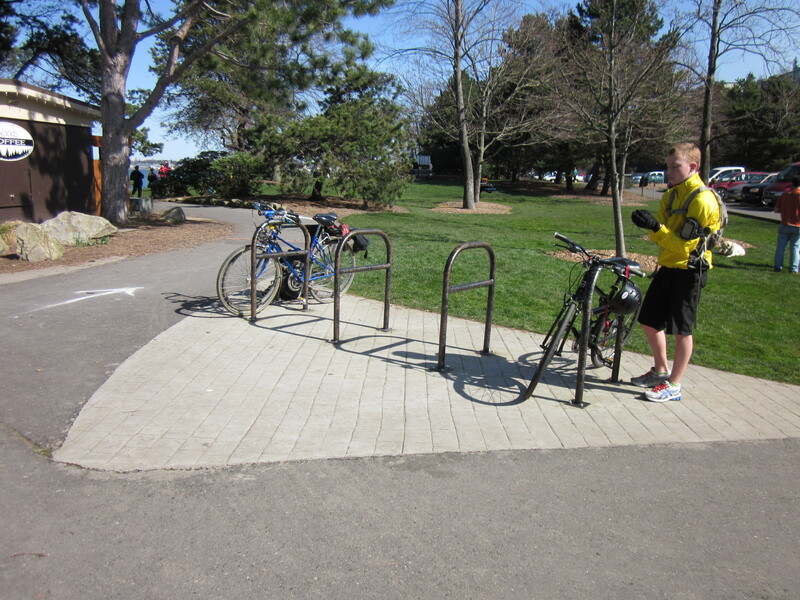 There are ample bike lanes and extensive bike racks. Riding bikes is subsidized, more than in San Francisco. This would be a great place to live for a biking family. While I was there, the paper covered a local move by bicycle. Another example: while I was in town I took some yoga classes at a studio in town. They offered free mat rentals to anyone who arrived by bike, bus, or public transit, because “it’s harder to bring your own mat that way.” A lot of people took them up on that offer. The studio, 3 Oms, was a lovely place, although my limited time there meant I had a limited choice of classes, and ended up in some inappropriate ones. The intermediate class focusing on learning new postures I visited while my daughter was napping was learning Astavakrasana (“one of the easiest arm balance poses!”), or, in my case, not learning Astavakrasana. 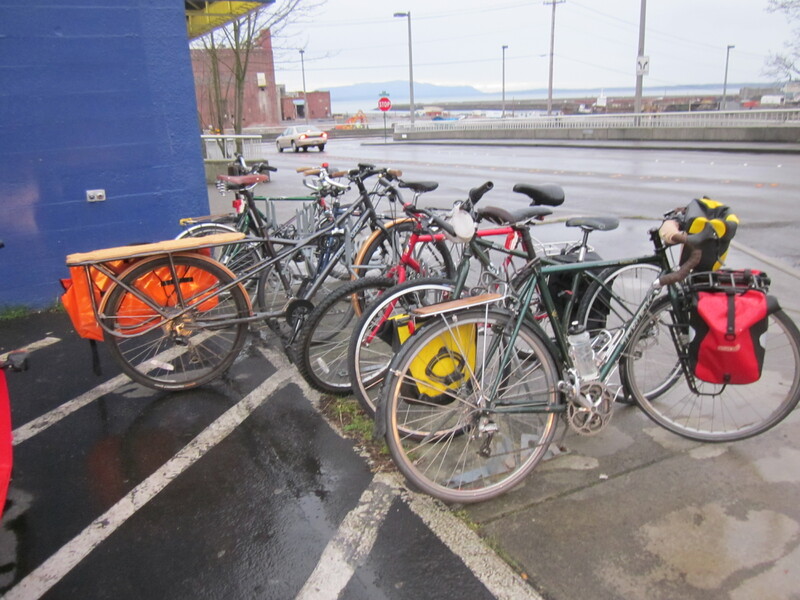 But this kind of support for alternative transit was not unusual; I saw it all over town. 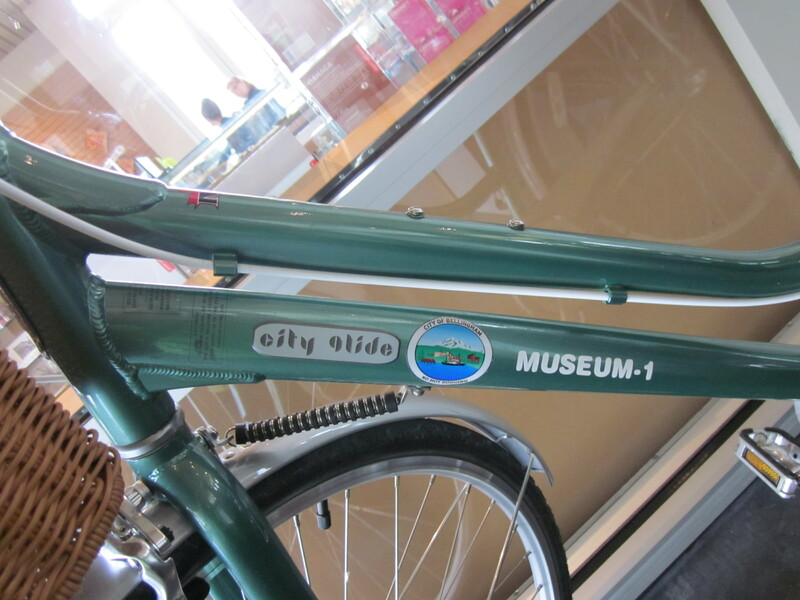 And again: when we visited the county museum, I spotted a lovely commuter bicycle by the entry desk. The woman working there told me that it was purchased by the city for employees to use for errands and lunches around town. 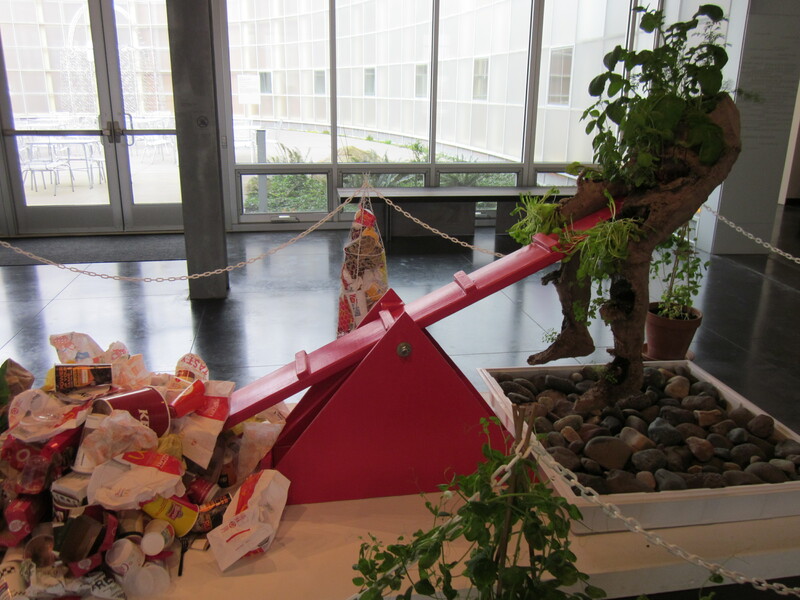 The museum had only one, but the Department of Public Works, with more employees, had four, and so on. She said she used it frequently, and wished she could afford one of her own. On closer look, I could spot the city logo. For obvious reasons, they did not bother to lock this bike up. My kids love visiting Bellingham. This always surprises me a little, as there is not much to do, relative to the city, but they like skipping school and seeing their grandmother and picking up pinecones in the woods around her condo and occasionally going a day or two without eating any vegetables. Although in the past I’ve sometimes gotten bored during a week in Bellingham, I found I enjoyed myself too. And at the end of the week, I even found a place to rent a cargo bike with an electric assist. 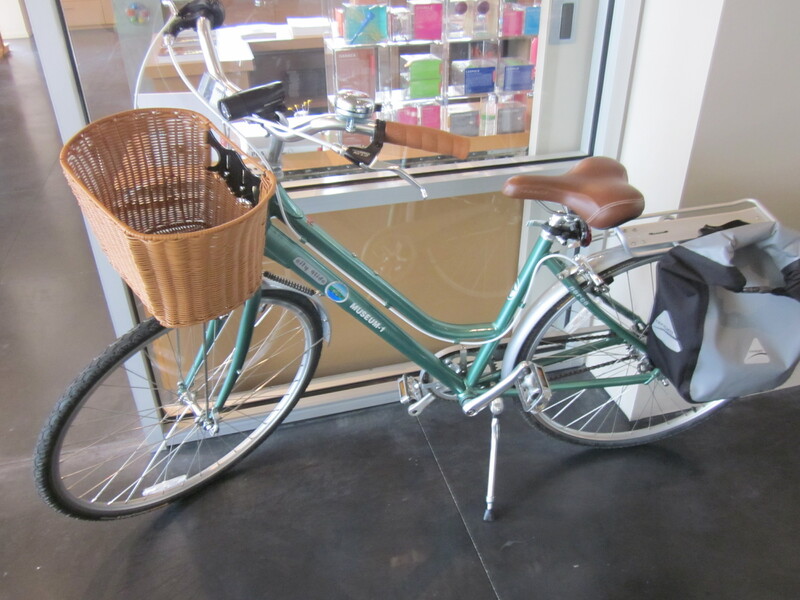 Next time we visit, we’ll be cruising around in style. Nice! I really like the orange one. Next time we’re in the ‘ham, I need to get the name of the rental place from you. Much as I hate hills, I hate driving more, and we felt really restricted there on transit. Really really restricted. 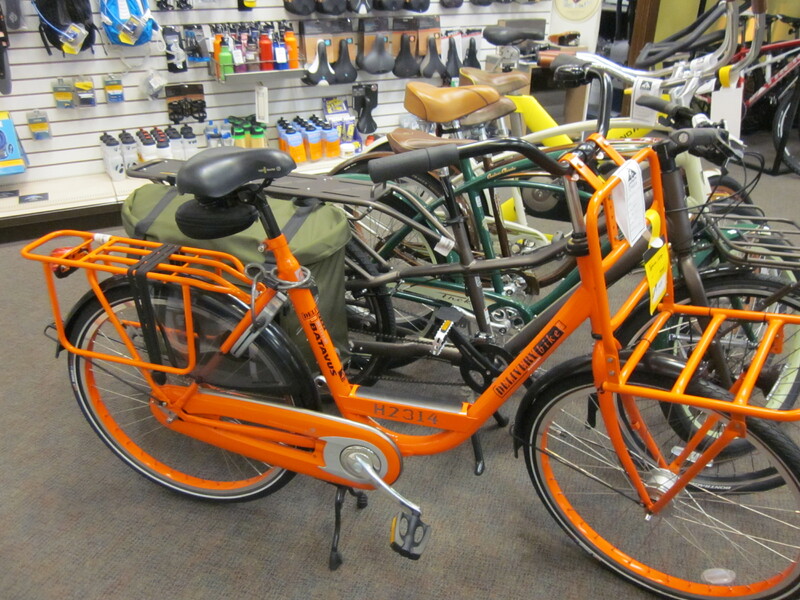 That’s a Batavus Personal Delivery (which lists for $1300 but was on sale for $750). Not a great climber but it could be fitted with an assist. They’re used to deliver mail in Europe. 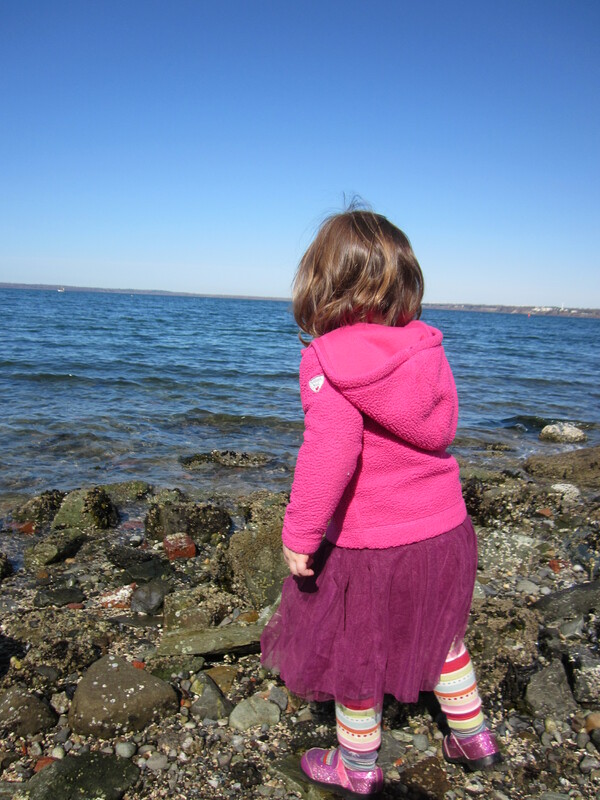 I was looking for blogs about Bellingham to share on our site and I came across your post…If you’re open to it, shoot me an email at jane(at)dwellable(dot)com.